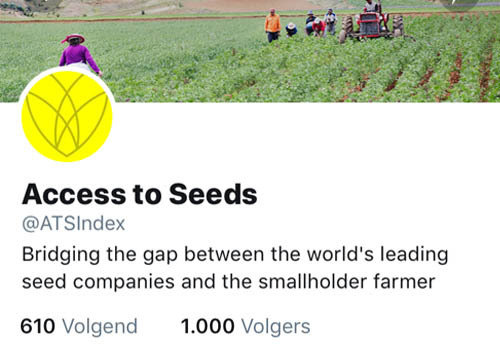 On 14 August 2018 the twitter account of the Access to Seeds Index hit the number of 1000 followers. The 1000th follower was Takesure Tozooneyi from Harare, Zimbabwe. The Access to Seeds Index uses Twitter to share its insights on the seed industry, to share other relevant insights related to access to seeds for smallholder farmers and to raise awareness on the relevance of this challenge. The considerable increase of the number of followers was the result of a Twitter campaign that started in the Spring of 2018. Goal was to increase the number of followers before the publication of 2018 Index results that will start in November 2018. Other social media channels used by the Access to Seeds Index are Facebook, Instagram, LinkedIn and Slideshare. The channel with most follower is Facebook with 1730 followers mid-August 2018.